What’s So Amazing About a Jellyfish? How Bad Can They Really Be? What Is the Evolutionist’s Response? They are not made of jelly neither are they actually fish. Yet the jellyfish is a fascinating creature. Two hundred species of jellyfish are presently known. The largest is the Lion’s Mane that can have a diameter of 8 feet and tentacles half as long as a standard football field. Jellyfish never stop growing. They have no brain, no respiratory system, no circulatory system, not even an excretory system (their mouth also excretes waste), and are 95% water. Jellyfish also have the amazing ability to move by jet propulsion, though they usually just travel by letting the tides and currents carry them. The most dreaded is the Box Jellyfish or Sea Wasp. They have a transparent body with a pale blue color and can grow to be 8 inches across and weigh 4.5lbs. The Box Jellyfish can move at over 6 feet/second and its sting can kill a person in 3 minutes. In fact, these jellyfish kill more people each year than sharks do, for the venom of one Box Jellyfish is enough to kill 60 people! Even a wet suit is insufficient protection. However, it cannot sting through nylons so lifeguards in Australia are often seen with nylons covering their legs and arms. 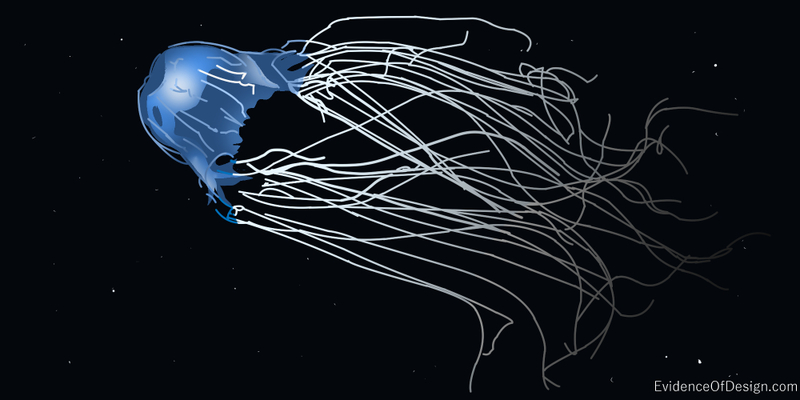 Unlike other jellyfish that catch food by drifting into it, the box jellyfish actually hunts its prey. “Box jellyfish venom is the most deadly in the animal kingdom and has caused at least 5,568 recorded deaths since 1954; each tentacle has about 500,000 sindasites which are harpoon shaped needles that inject venom into the victim.” (Wiki) They can be found in Australia, the Philippines, Hawaii, and other tropical areas. Even though the Box Jellyfish is so deadly, it does have several enemies. Rainwater can have adverse effects on the jellyfish because of it being made of fresh water, instead of saltwater like others of phylum coelenterata are accustomed to. Some marine species, like turtles, are immune to the venom and even feed on jellyfish! Consider, for example, the sea slug. Some types of jellyfish have poisonous capsules called nematocysts that explode to provide food and protection for the jellyfish. Sea slugs actually feed on these jellyfish. The unexploded nematocysts are transferred to special sacs in the slug’s skin. There, the nematocysts become a defense system for the slug. How can a brainless creature produce a toxin so deadly to people? How did some marine animals develop immunity to the poison? Dead creatures can’t evolve anything! How could the sea slug develop a system of defense involving the ingestion of explosive capsules and then use them itself? Evolution has no answer. However, creation simply states all this was in place in the beginning and no development process was possible, or necessary. The jellyfish is, instead, more evidence of the handiwork of a wise Creator.